News organizations forced to make corrections include the Los Angeles Times, Boston Gobe and the Chicago Tribune. It was the blog Little Green Footballs that’s getting the credit for cacthing the deception. Many photo editors intervied for the article feel they should have caught the manipulation before publication. 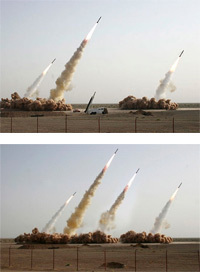 Others believe they should have done a better job of sourcing the photos since some did not indicate that the picture came directly from Iran’s Revolutionary Guards.